Issues: Write Strategy section; add worlds to infobox where Rare Tama Sheep appear. 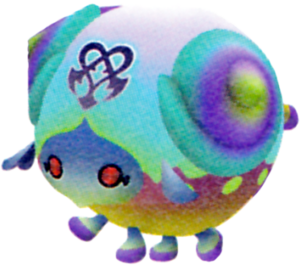 The Tama Sheep is a type of Dream Eater that appears in Kingdom Hearts 3D: Dream Drop Distance. The Tama Sheep is a sheep with a round, ball body. Tama (玉?) is the Japanese word for ball. Its name is also a pun on the Japanese word for "soul" (魂, Tamashii?). As a Spirit, the Spirit emblem is on the top-half of its body, which is white in color but can be changed with Paint Guns. Its lower body shows a contrast of lavender and turquoise and has several white spots. In the middle of its body is its face, showing a contrast of yellow and red, and it has black eyes with arrow-shaped pupils that changes color depending on its disposition. It also has a red, diamond-shaped mouth. Its small, flapping ears are pink and its thin legs are pink with blue hooves. It has large horns which are orange, yellow and green. As a Nightmare, the Nightmare emblem is on the top-half of its body, which is dark purple in color. Its lower body shows a contrast of yellow and purple and has several black spots. In the middle of its body is its face, showing a contrast of blue and light green, and it has red eyes. Its small, flapping ears and thin legs are blue with purple hooves. It has large horns which are blue, purple and green. 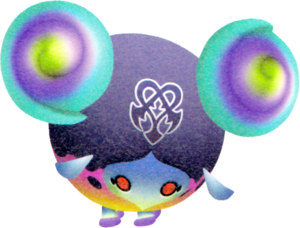 As a Rare Dream Eater, the color scheme is similar to the Nightmare's. The Nightmare emblem is on the top-half of its body, which is white and blue in color. Its lower body shows a contrast of yellow and pink and has several lime spots. In the middle of its body is its face, showing a contrast of blue and light green, and it has red eyes. Its small, flapping ears and thin legs are blue with purple hooves. It has large horns which are blue, purple and green. Although Tama Sheep are easy to defeat, their version of Sleep increases the rate at which the Drop Gauge depletes, so it is important to either defeat them quickly, or make sure to have plenty of Drop-Me-Nots on hand to reverse its effect. 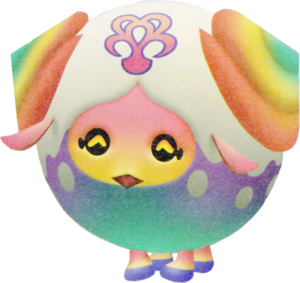 A good way to counter a Tama Sheep's Sleep is to possess a Tama Sheep of your own, as it is one of the few Dream Eaters with Sleep Block. As an ally, it is useful for forcing nearby Nightmares to fall asleep, allowing Sora and Riku to strike enemies while they are vulnerable. At higher levels, it can slowly recover Sora and Riku's health by casting Regen and Drain. By default, Tama Sheep have low magical defenses to all elements, but this can be remedied with Block-it Chocolate. ↑ 1.0 1.1 1.2 1.3 1.4 Available after Secret: Green at D-2 has been unlocked. ↑ 2.0 2.1 Becomes available when in Mumbler disposition. Riku can obtain the Tama Sheep Recipe from the third Special Portal in Traverse Town. The Tama Sheep can be created through six different recipes. The fifth recipe is a rank B recipe that has a 60% chance of success. This page was last edited on 3 April 2019, at 18:56.